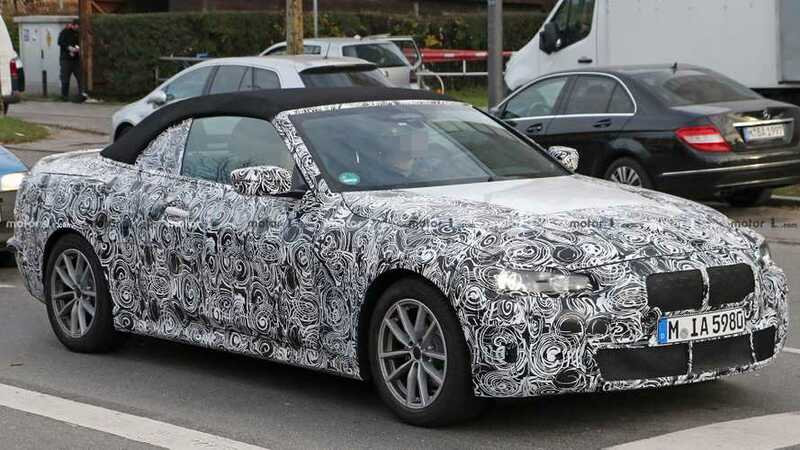 A fresh batch of spy photos provide another look at the next-gen BMW 4 Series Convertible's development, and this gallery comes with the extra surprise of showing the cabin for the first time. The interior probably looks familiar to anyone with even a passing knowledge of the latest 3 Series. The new 3 Series will on sale in the U.S. in March 2019, and the latest 4 Series will likely debut before the end of the year. As with the current models, the pair will have a lot in common by sharing the same platform and engines. The only major difference will be the number of doors, with the 4 Series being a two-door (except for the Gran Coupe) and the 3 Series as a sedan (except for the wagon). The similarities between the 3 and 4 Series are also obvious on the inside. This 4 Series appears to have a sportier three-spoke steering wheel over its sedan counterpart. The button for operating the power roof sits in the center console next to the control for the electronic parking brake. Beyond these slight tweaks, the two models seem otherwise identical. Since the 3 and 4 Series share powertrains, we already have a very good idea about what options are available under the hood of this convertible. In North America, the base mill would be a new 2.0-liter turbocharged four-cylinder making 255 horsepower (190 kW) and 295 pound-feet (400 Newton-meters) of torque and running through an eight-speed automatic. Customers could also upgrade to a 3.0-liter turbocharged inline-six engine producing 382 hp (295 kW) and 369 lb-ft (500 Nm) of torque. A plug-in hybrid would be an option, too. Europeans could also get a less-powerful, gasoline-fueled four-cylinder and have three diesel choices.